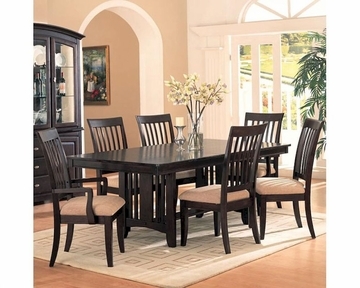 This lovely dining and chair set table will give your dining room a sophisticated style. The table has a simple mission inspired style that will blend well with today's contemporary home, featuring a smooth rectangular table top that easily extends with a 12 inch leaf, from 72 inches long to 84 inches long, making it a great choice for those who love to entertain. 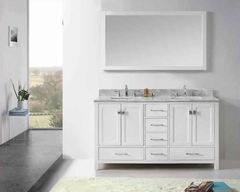 Rounded edges and a simple apron complement it nicely, while the double pedestal base has a beautiful slat detail for a touch of distinction. The chairs have high slatted backs for an elegant look, with sleek square legs, and comfortable neutral fabric covered padded seats. Rich dark Cappuccino finished wood will create depth in your space, for a warm and inviting room that friends and family will enjoy.